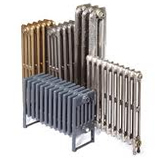 The Anthracite Electric Heating Elements are available in a range of heat outputs, allowing you to turn your traditional Cast Iron Radiator into a stand alone, electrical heat source. The total length of the heating element including control is detailed below. Contact us on 01723 321 333 if you have any questions.